Well, I finally got around to building my DIY hood for my 72 gallon Paludarium. I'm going to spring for some compact flourescent lights, but I'm not sure what to get. I am currently running 3, 32 watt, 48" T-8's; 5000K, 6500K and 6700K. I can't seem to keep red in my fireballs, etc and and my java moss has recently died off. Not to mention I can't keep the terrestrial moss alive. What Compact Flourescent set up should I use? What about ure paludarium? Any pics? Give us the dirt dude, how much is land how much is water, are u using a filter, if so what type, etc. I would suggest you at least double the amount of wattage on the tank. I would go either 2X96 watt or 4X55 watt compacts. I belive the 96s are 36in long and the 55s are 22in. 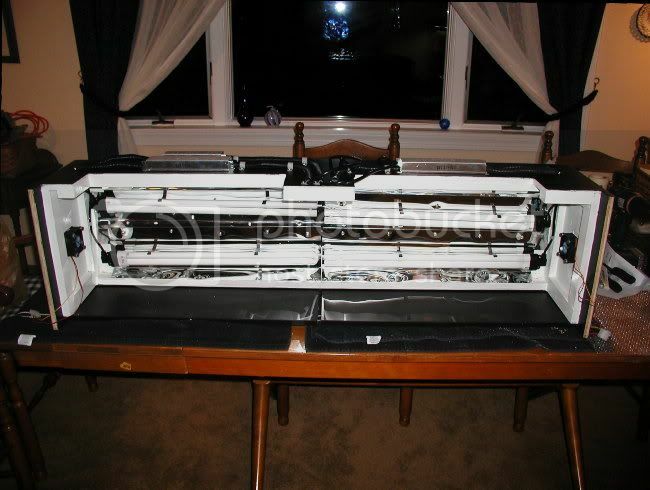 So chose the setup that would allow you to get the most even light distribution based on your tank demensions. 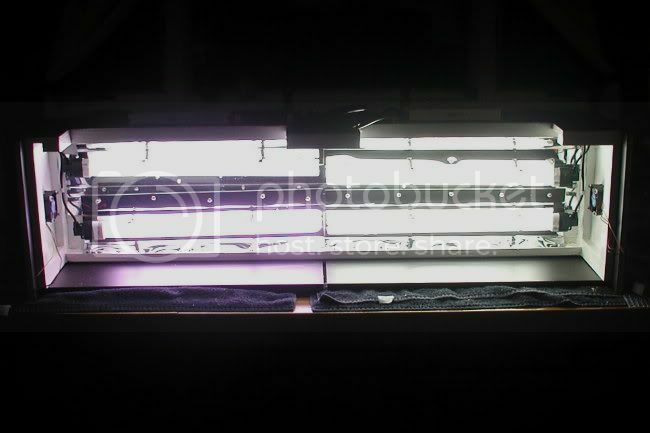 If you are wanting to just add to what you have, you can get a 2X55 watt setup with your choice of bulbs from Aquarium Supply Liquidators for around 70$ shipped. Thats about the best price I have found. i found some nice halogens at home depot for about $29 for a package of 5. they add a real nice look to the tank and all of my plants grow like crazy. i use them to supplement my flourescents in almost all of my new setups. ill post a pic of a viv with some in use and try and post a link with them in it, when i figure this site out a little better. OK, I got the hood completed. Two computer fans, one at each end. Four 55 watt compact fluorescents, 2 - 5500K, 1 - 6700K and 1 - 9325K. Here's a pic of the inside of the hood. I'll post some pictures of the installed hood later and let everyone know how the lighting works out. im curious as to how the different spectrums are going to show up when the tank is lit. When all of the lights are on, you don't notice any difference in the lighting. The layout was planned for my optimum viewing. out the colors in my Neons. terrestrial section of my tank. All of the lights are on timers. Yea, I know it's overkill and a little obsessive, but I enjoy setting it up and having the tank as automated as possible. And I'm still working on adding a moon lite for an hour, after all the lights are out. every light that i can put on a timer, i do. i like having the sunrise/sunset effect. id love to see pics when you gt a chance. it sounds great. i have a 110x paludarium, that i just love. it gets more comments than my reef or chameleon. i think im going to try and set one up in a 29, allthough in that size i may have to reduce the water feature, and just go with more of a vivarium. good luck!! and keep me posted! Here's a picture of the tank, prior to the new compact fluorescents. that is an awesome tank dude. does the water travel under the land section or is it divided? also, is your fitration under the tank? if so did you hide the intake in that cork tube in the corner? is that one of those dry moshrooms that the water is flowing off of? sorry for all the Qs you dont have to give all the secrets away. The land and water are truly divided with plexiglass. The filtration consists of a sump and canister filter. The siphon for the canister filter and one of the water supply lines run inside the cork curl in the right rear corner. The waterfall is a piece of Ghost wood. It was shaped pretty good to start with, then I just tuned it a little with a dremel tool.